If the viewer adopts the pose of a transcendental subject, floating above planet Earth, one can see Venice in the past, Edinburgh in the present, and the faint outline of an as-yet-undefined future in the work originally shown by Alex Pollard, Cathy Wilkes and Tatham and O’Sullivan at last year’s Venice Biennale. 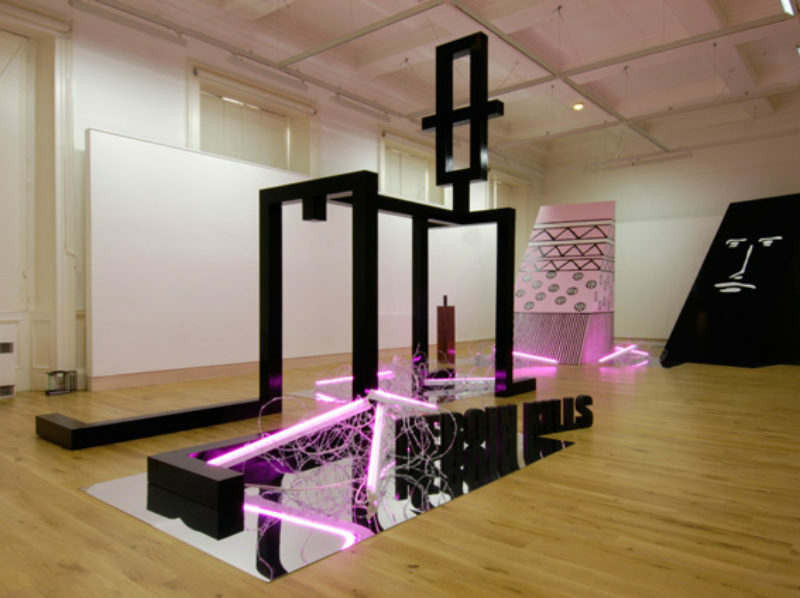 The latest incarnation of this travelling show—Selective Memory at the Scottish National Gallery of Modern Art and Echo Echo at the Collective—rests here for a few months, before being reconfigured sometime in the future. With each step along the way, it becomes increasingly self-reflective, complying with the vision of curators Jason E. Bowman and Rachel Bradley. Selecting artists for the Biennale, Bowman and Bradley were interested in showing work with distinct formal vocabularies which would be developed, cross-referenced, expanded and expressed. One only hopes that the artists did not feel limited by this cosy theoretical hug. But based on the work shown, Pollard and Wilkes flourished in this imposed climate, while Tatham and O’Sullivan wilted under the strain. 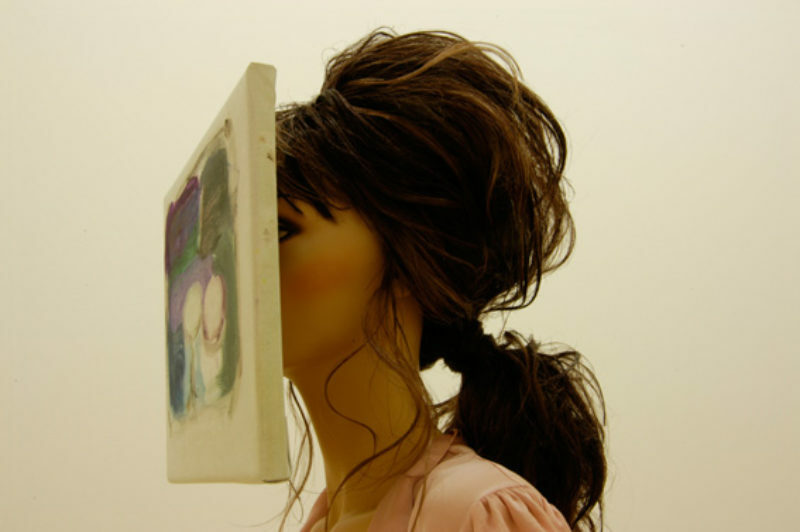 Too much is made of the impenetrability of Cathy Wilkes’ installations. This interpretative approach asserts that there is something to be got, a golden phallus of some sort organising the work. But Wilkes’ work critiques this assertion; hers is a deconstructive feminist expression of the highest order, as it dares the viewer to reduce it to ‘woman’s work’. As a strategic expression of deconstructive feminism, it is highly intelligent. Wilkes does not bark ideology, but employs seductive formalist ploys in order to please the sceptical viewer. Her untitled installation is expertly composed; everything that could be learned about space from painting and sculpture is here. The film entitled ‘Most Women Never Experience’ (commissioned by Frieze Art Fair and first shown in October 2005) forces the question: experience what? If we put a Lacanian emphasis on the title and pluralise the word ‘woman’, barring all claims to universality, then the film can be seen as questioning the urge to reduce women to biology, even when they are gleefully rubbing their pregnant bellies. The sound (by Torsten Lauschmann) frames the action with Pasolini-esque Roman bombast; one expects Medea to be lowered in a deus ex machina, to haul all her little children into the almost-death of the mother/child dyad. Alex Pollard drags da Vinci’s analyses of man, genius, creativity and geometry into the present. Everything is reduced to its constituents; a new space is created where art rushes out through the expectant frame of an equals sign. The work is permeated by the wit of Jasper Johns. Johns’ ‘Savarin Can’ of 1960, is raided for its hyper-real paintbrushes, which are broken and positioned as iconic constructions depicting the armature of the human body. In ‘Wall Drawing’, Pollard creates hands out of broken faux-rulers, taking the measure of a man and then letting that ‘man’ draw and measure pictorial space on the walls with a soft, dark pencil. Some lines are roughly erased (a nod to Rauschenberg’s ‘Erased de Kooning’, 1953), whilst others stop before a circle is complete or the apex of a triangle is found. 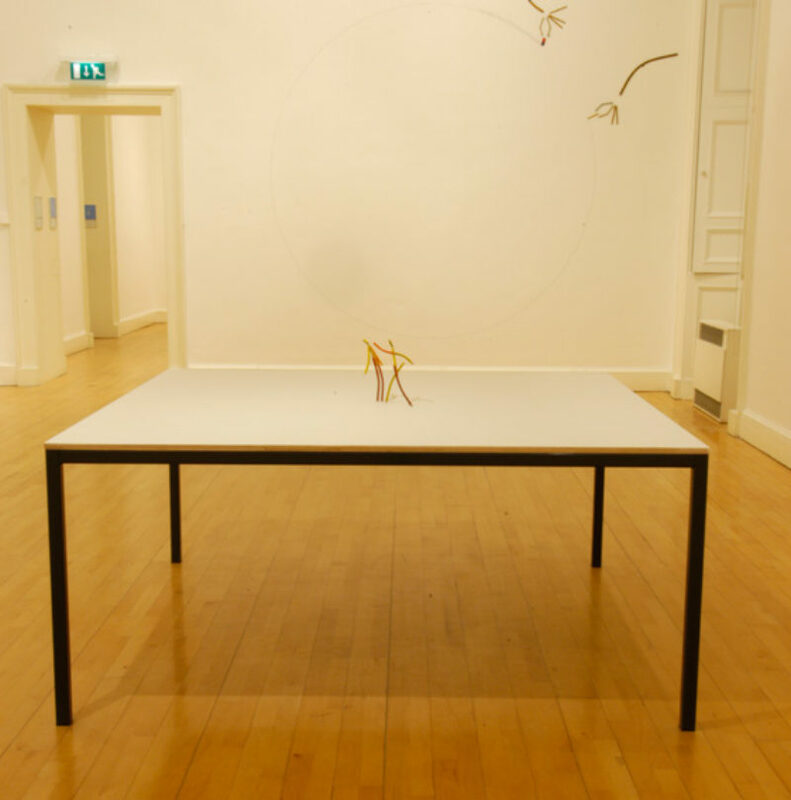 In ‘Figures’, for example, the white tabletop becomes a gladiatorial arena where puny matchstick men fight it out (the ‘men’ made out of jesmonite in the form of broken pencils), but their fragmented little bodies are left frozen in ridiculous gestures. All the equipment used to create these works appears to be present, now broken after the act. But it is all artifice; nothing is real. If everything is artifice, then surely Tatham and O’Sullivan’s baroque installation should dominate this landscape, yet it does not. Their mini-retrospective is plonked in the main gallery space like a huge salmagundi, neither ugly enough to be interesting, nor seductive enough to be intriguing. There is something glib, ironic and snooty about this monstrosity that comes across like a YBA raspberry being blown in your face. If it’s meant to be funny it doesn’t succeed. Without having the defence of being innocent or naïve, it shouts loud with neon and mirror, conceptually barren and formally unsuccessful. There is a sense of overall organisation: it is balanced and placed properly, but this is not enough. The self-referential box set by the curators is ticked (over and over again), yet we are given nothing more. Perhaps this is the intention of the artists, but—despite some promising corners and edges lurking at the back of the installation—art is elsewhere, with Pollard and Wilkes.